This week has felt very disconnected for me. I had lesson plans, and most of them were completed. Our schedule wasn't different than any other week, still I felt like I was running behind all week and never quite prepared for the next situation. Academically, we had a good week. We continued the study of World War I, using both curricula to give Amber a better picture of the events and mindset at the time. We also includes some narratives from a Heritage History CD. Amber is actually enjoying this period in history just as much as the Civil war. I'm beginning to get worried about her. She had a blast studying the Revolutionary War, Civil War and now WWI. I really need to find a peaceful time she likes to study too. I was floored to realize, even though I already knew the dates, it has been almost 100 years since WWI started. A whole century! Somehow, it doesn't seem like it should have been that long ago. My grandfather was a teenager during WWI. Amber wasn't as impressed and just gave me the "you're old, so what" look. Fred and Amber both shaking our ice cream mixture. It tasked only so-so, but was fun. 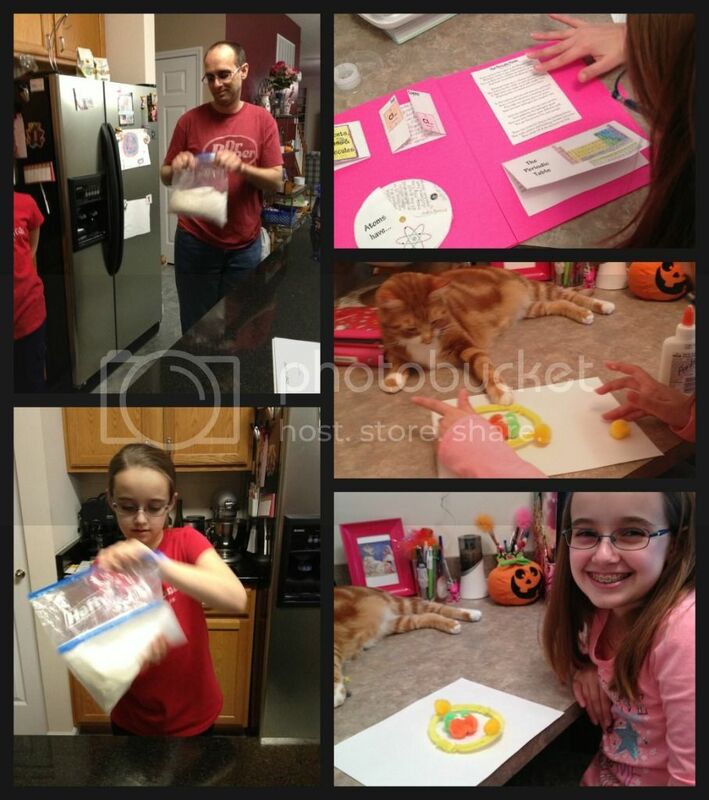 Amber working on her lapbook for science. Amber working on a model of a Helium atom. Biscotti really thought those electrons belonged to him. We had to chase him down to retrieve the puff balls. Amber's finished model of Helium. We continue to love our small science detour into the periodic table. Amber is having fun building her very first lapbook, even though she is tired of coloring things. She'd rather do the narration work only and leave the art work portion. I'm being grumpy about it, and requiring the art portion, for once. One evening we all participated in a science activity, that had some edible results. The point was to learn how salt can not only lower the freezing point of water, but makes it colder. We mixed together ingredients for a batch of homemade ice cream and then shook it up in a ziploc surounded by ice cubes. Not much happened. But when rock salt was added to the ice cubes, the milky mess quickly (in less than 10 minutes) became hard ice cream. Amber thought it was the best experiment ever, since she was able to eat the results. We did find a couple of iPad apps to use with the periodic chart unit too. The apps are our favorite resources this week. 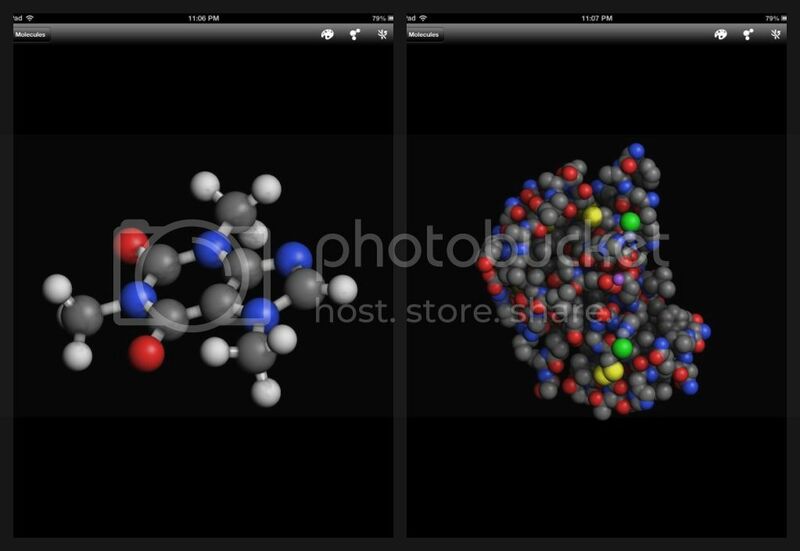 The first app is Molecules. You can search a database to see the molecules of many common chemicals, medications, even food. We've had a lot of fun identifying the elements that make up so many of our every day items and medications. Amber's favorite was the densely packed insulin. The other iPad app we have been using is called, simply, Periodic Table. 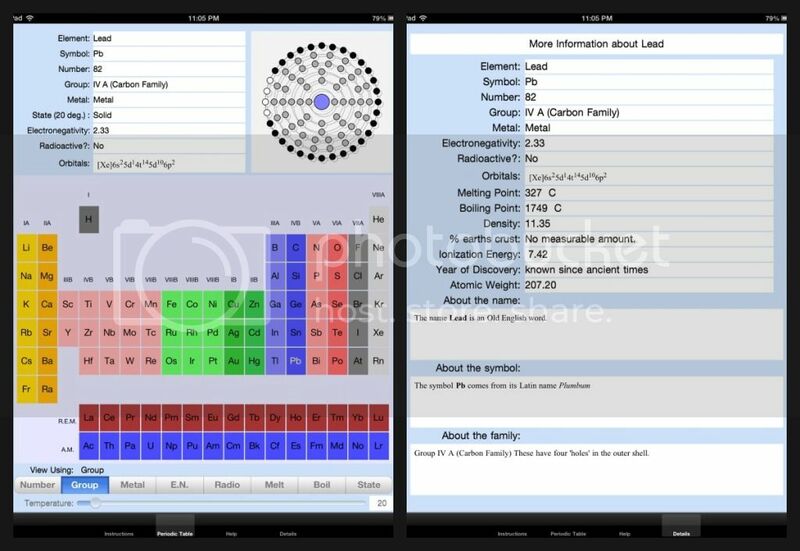 It is an interactive version of the periodic table that allows you to color code the elements by various common traits. You can also click on an element to get more specific details, including a visual representation of the shells with electrons, and the origin of the element's name. Amber has been obsessed with knowing the origin of element names and, in the less obvious cases, how the chemical symbol relates to its name. This app has saved me a lot of research on each element. Amber's novel for NaNoWriMo is progressing well, I think. I've not been allowed to read it yet, but she is over halfway to her word count goal and on track to complete the word count by Nov. 30th. I'm not sure the novel will be finished within her word goal, but she can continue that after November too. We packaged up and delivered our Operation Christmas Child boxes this week too. 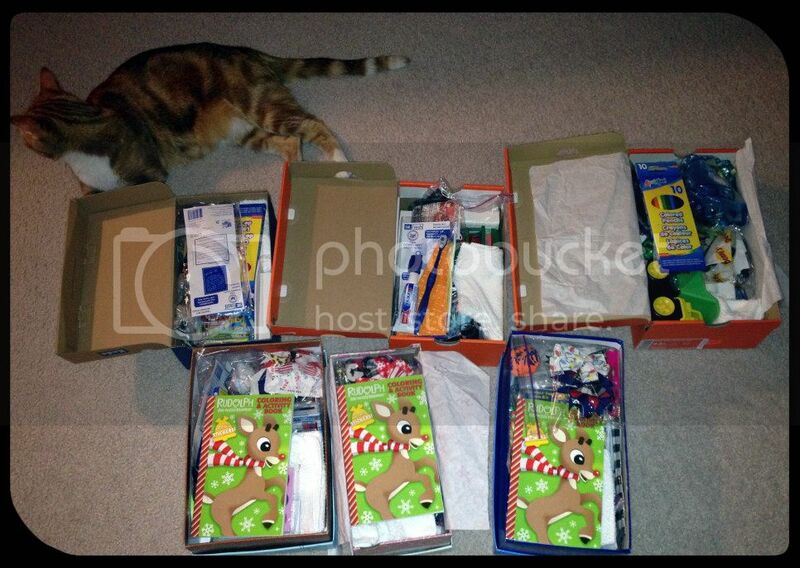 Amber has been helping me with OCC shoeboxes through MOPS and then through her school since she can remember. Her last school did not participate in OCC, so we branched out on our own 2 years ago. Oddly enough, the drop off location is less than a mile from our house, it really works out well for us. Six Operation Christmas Child boxes filled. 3 boys and 3 girls. Biscotti had to help at the last minute. While we were shopping for a couple of last minute additions to the boxes, Amber said to me "I love shopping for Operation Christmas Child. It's one of my favorite pre-Christmas things to do". Aww, now that's what I want to hear. She had definite ideas of what needed to go into the boxes and how everything was going to be arranged. Thankfully, she has some of my practicality and we were able to include some hygiene items as well as fun things. We also did some shopping for other service projects that we participate in through our church. I'm still looking for a service project for us that includes more actual service and less purchasing. It's not that I mind purchasing, but I'd like Amber to see that helping others is more than buying them things. Unfortunately, lately it seems what is needed of us is only my ability to swipe a credit card and Amber's ability to load up a cart. Christy: Able to sleep late on Saturdays, a good church service, time alone to finish some projects (while Amber was with her grandparents), Google calendar that keeps me sane, our new washer and dryer that we purchased in July, Fred's job that allows me all this time with Amber, my own health - even when I'm feeling crappy. This week, I've also been thinking about moving to less structured curriculum for several subjects. We have fallen into the trap of letting the curriculum run our school day. I'm still working out how this might happen. Will we change curriculum entirely or can I be brave enough to ignore the provided lesson plans? After such a successful week, I almost think we should start Thanksgiving break now, but we need the extra time to complete our current topics if we want to enjoy both the Nutcracker and A Christmas Carol studies before Christmas break. So, our Thanksgiving break doesn't start until Wednesday. I hope everyone has a good weekend and enjoys their Thanksgiving holiday. Homemade ice cream can be very yummy! I've never tried making it in a baggie though! LOL We have an ice cream ball - cream, 1/2 and 1/2, sugar, and vanilla go in one opening and ice and rock salt in another - and then the kids roll it around and shake it. Makes me think we should give it a roll sometime! Look at those great Operation Christmas boxes! I don't think our Thanksgiving break will start until Wednesday, either -- I don't have much to do for Thursday (since we go to family's house) and I think I'll enjoy the more relaxed days to actually do more read alouds and science. I like all of the suggestions you have for the Periodic Table! Another great week Christy! We have made ice cream like that before. Yummy. We start WWI next week. Any great sites or resources you could point me to? If so, shoot me an email. :) We have both of those apps and Keilee was just on the Molecules one last week. She is all into DNA now. Her lapbook is looking really good. Keilee never really liked lapbooking. I mean she did several but was never in love with them. I LOVE your OCC boxes. Great job both of you. 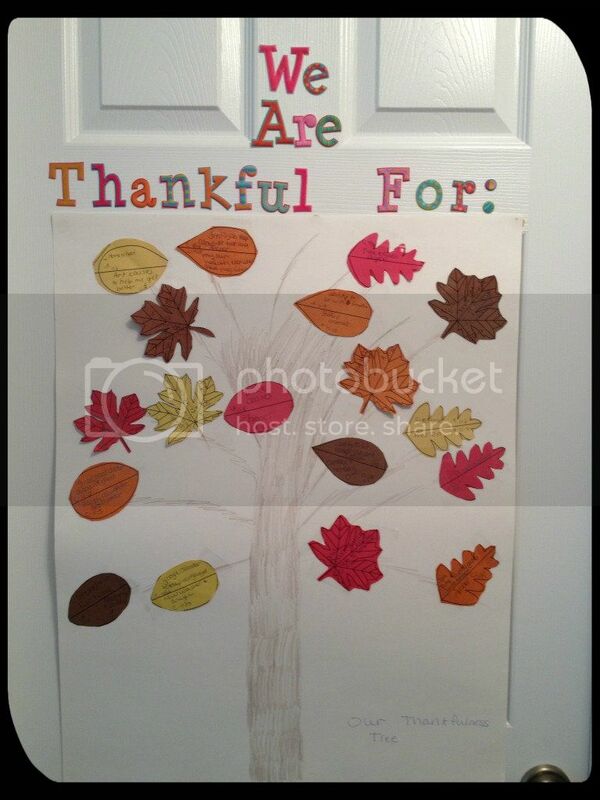 I love your thankful lists each week. Such a great idea especially to ask Amber too. Kei is doing the NaNoWriMo too. She does it in spurts, working on it for a few days and then not doing it for days. Have a great weekend Christy! Tell Amber hello from us. Those 2 science apps sounds awesome. I pinned them for use later; thanks for sharing! I'll have to check out those apps you mentioned. Thanks for sharing! It's great that Amber is so into studying both WWI and the periodic table...it's awesome to be excited about learning! Thanks for sharing your app finds at Favorite Resources.